For my thirteenth birthday in 1966, my parents gave me a portable AM transistor radio. I was thrilled. Every teenager I knew wanted one. My radio was six inches by four inches or so, ran on a 9-volt battery, and came with a brown leather carrying case, a long strap so I could carry it over my shoulder, and most important, a single earphone. I wish I could remember the brand. I carried my radio with me everywhere I went outside of school hours, and that earpiece was in my ear from the time I got up until I left for school, and after I arrived home from school until I fell asleep at night. Having your own AM portable radio doesn’t seem like much of anything now, when electronics like MP3 players are so inexpensive and pervasive, there are dozens of AM and FM radio stations, music is available over the internet and every cell phone can play music, but at the time it was a big deal. For the first time I could listen to whatever music I wanted without my parents hearing or commenting on what I was listening to, or telling me to turn it off. Teenagers developed a whole life and culture of their own centered around music. We had the portable transistor radio to thank for our independence. My family lived in a northern suburb of New York City, and the rock-and-roll station at the time was 77 WABC AM. There may have been other AM stations playing rock, but if so, I don’t recall what they were. FM rock radio was still a couple of years away. The music played by Cousin Brucie and the other WABC DJs coming through the tinny speaker or earphone on that little radio became the soundtrack for my life, and the lives of my friends. When we got together out of adult earshot, kids with radios all tuned to WABC at the same time and turned the music up loud. We danced for hours to the music coming through those tinny speakers. 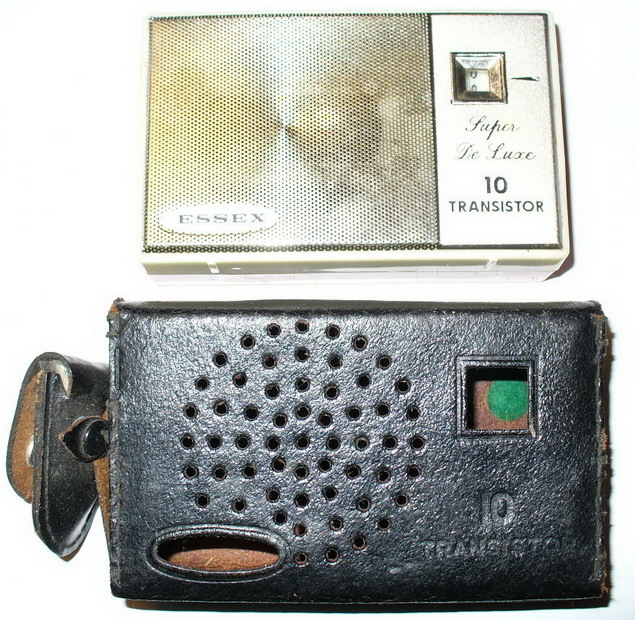 A transistor radio and leather case from the 1960s. This is very similar to my radio, down to the pouch on the carrying strap for the all-important earpiece! Terry from NJ writes: I had a little aqua blue transistor radio, I think it was a Zenith. My friends and I listened to WABC for hours waiting to hear our favorite songs, especially the latest Beatles hit. J.G. from NY writes: Looking back it seems strange that such a little thing could mean so much, but having your own transistor radio meant you could be part of something your parents knew nothing about, especially once FM radio became big in the late 60s. Terry from NJ writes: J., that is true. I wonder if the whole “youth revolution” of the late 1960s would have happened without the transistor radio! So much of it was centered around music. If you didn’t have your own transistor radio you could only listen to what your parents wanted to hear since the radio was usually in the living room or the kitchen. There was always the car radio, but you needed a driver’s license or a friend with a license and a car, or you had to go someplace with a jukebox, which meant you needed money. J.G. from NY writes: You didn’t just need a driver’s license, you also needed your parent’s permission to use the car! Anyone remember the Raceway Park ads that used to play on WABC? K. from NJ writes: Those Raceway Park ads seemed to run every couple of minutes! That weird voice shouting: “HA HA HA HA……RRRRRRRRacewayyyy Park!!!!! !” I remember my mother asking how I could stand to listen to the same stuff over and over and over. 77 WABC pretty much only played the top 10 hits and they played them over, and over, and over. An “oldie” was any song more than a month old!